It was raining when I spent a whole day exploring Sitka National Historical Park. As the park is located at sea level, it was a bit greener than the mountain trail I hiked the day before. When it's wet, the green is brighter than ever. 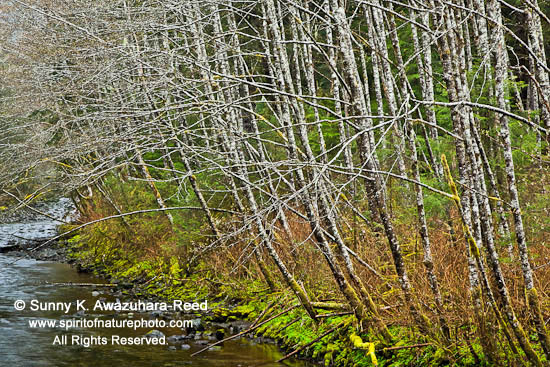 It was still early spring; the red alder trees were still naked without leaves. 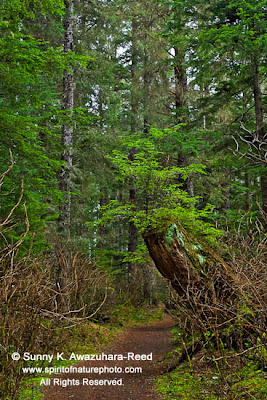 Walking in the rainforest, I often hear the raven's song echoing from somewhere deep in the woods. 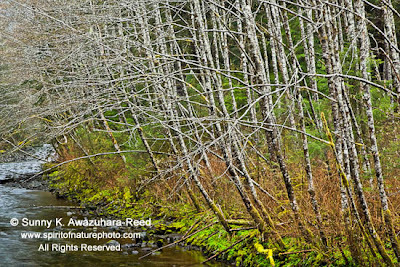 Weathered totem poles stood along the trail, which perfectly blended in the old growth woods. Walking in this rainforest was a spiritual... it somewhat reminds me of an old shrine in the deep forests in Japan. The trail opened up to the coast. 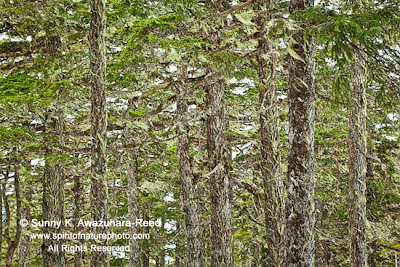 Numerous small islands covered with trees are scattered around the Sitka Sounds... nobody around in this quiet little cove. Sitka National Historic Park celebrated its 100th year anniversary in 2010. It's the oldest National Park in Alaska. 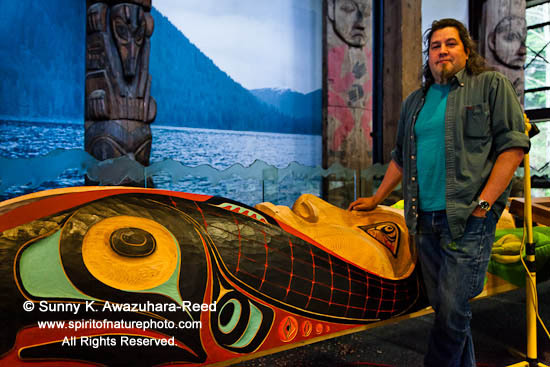 Celebrating the Centennial Year, National Park Service commissioned the special totem pole with the master carver Tommy Joseph. 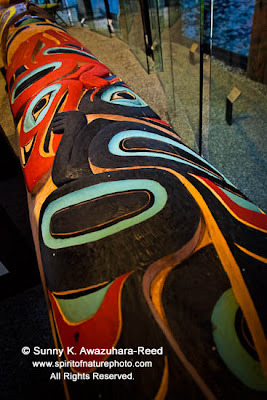 The totem pole represents Sitka and the surrounding area and the National Park Service. It contains a buffalo (a symbol of the National Park Services), an old Russian marker plate, the native plants (skunk cabbage and devil's club), two salmons, and a spiritual woman's face. Its light green and yellow colors are non-traditional for the totem pole. 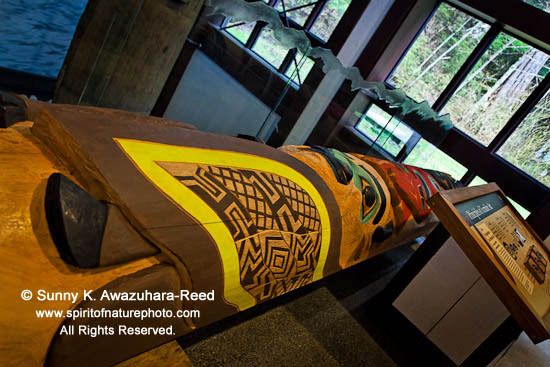 The pole, almost finished, lays at the Park Visitor Center for the raising ceremony on May 15. Too bad I missed the pole raising by a week! On my next posting, I'll write about Michio Hoshino's totem pole, which is the memory of the famous Japanese photographer killed by a bear in 1996. 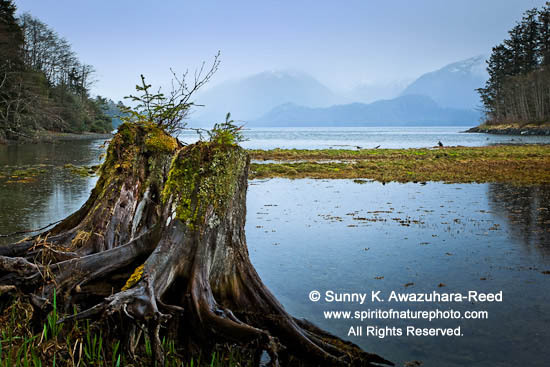 Sitka: "The Most Beautiful Southeast Alaskan Town"
The misty rain enveloped the passage between forest covered islands... It's typical weather in Southeast Alaska region: one of my most favorites area. The Alaska Marine Highway ferry from Juneau arrived to Sitka in the afternoon when my adventure began. 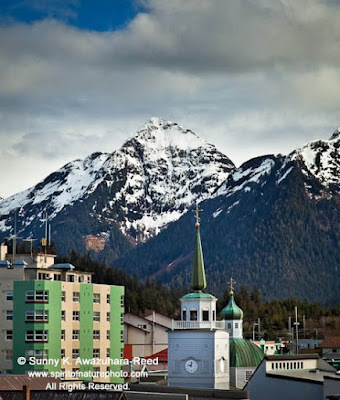 Sitka is located on Baranof Island, about 150 miles south from Juneau. Like other Southeast Alaskan towns, Sitka is surrounded with green moss covered rainforest, glacier carved waterways, and snow capped mountains in the back drop. "Alaska's the most beautiful town" how many times I heard about this... so I'm here to see. 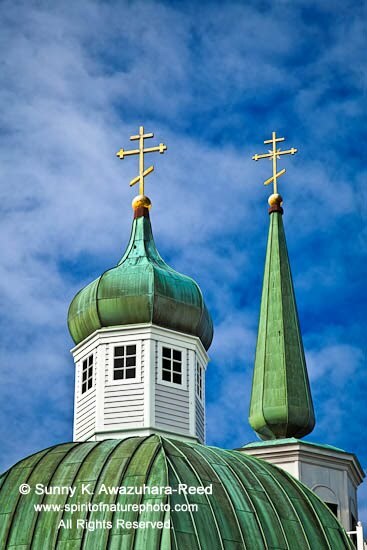 Sitka also has the rich history. It was an old capital for Russian Alaska, and the capital of the territory of Alaska after the United States bought Alaska from Russia, until Juneau became the state capital in 1906. There are some old Russian buildings remains throughout the town. 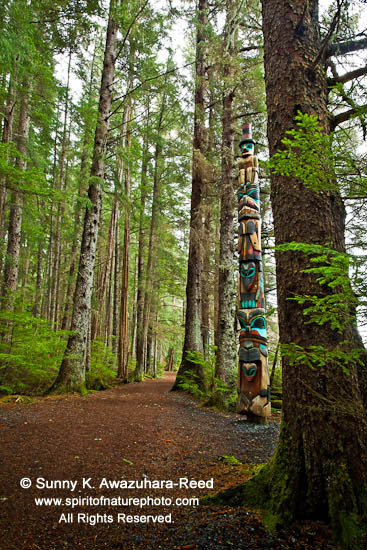 Tlingit Native cultures are still deeply rooted in Sitka: totem poles and Tlingit carvings are scattered over the town. 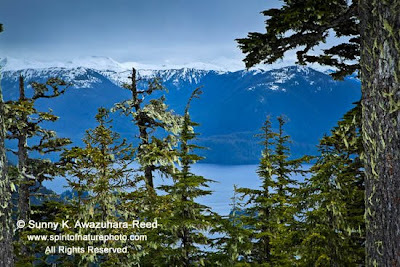 I was hiking through the rainforest to the alpine ridge, through the wet meadow to the rocky coast, all under the overcast sky and in a misty rain. It was early in the season, the greens starting to appear among the brown grass. There was still snow high up on the mountain trail. 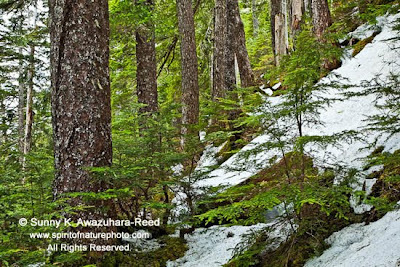 After half a year of living in the interior Alaska, I'm back in the rainforest in Southeast Alaska...for a short while. Surrounded with moss drenched tall trees, the smell of the ocean, and the sound of raven songs... plus hilly old towns... I love the Southeast Alaska! 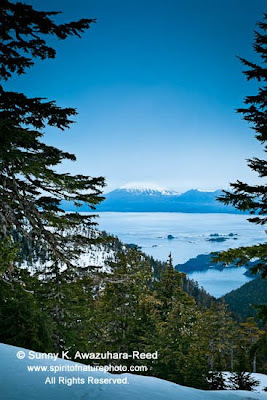 Here is the Sitka's natural landmark, Mount Edgecumbe; it reminds me Mount Fuji in Japan.